Alison Shaffer: SMALL FOOT is coming to a theater near you on September 28, 2018, Movie ticket giveaway. SMALL FOOT is coming to a theater near you on September 28, 2018, Movie ticket giveaway. Do the Yeti, it's a dance for you to show your stuff. A Giveaway of movie tickets and promo items. You read that right-SMALL FOOT, not BIG FOOT. A casual day in the Yeti clan is interrupted by a monster that brings a Small Foot (human) to the neighborhood. The Yeti clan is pretty tight, they stay in their frosty land and don't venture to far out of range. A young Yeti gets a glimpse of a human boy as he falls to the ground from the monster which is really an airplane. He's there and then he's gone. Where did he go? Where did he come from? So many questions. Yeti has imagination in his heart that he wants to find the human. He takes a big leap of faith and goes to search for what lies outside of his community. It's not common practice for a trip outside the cold climate, so panic arises when he leaves the clan. Secretly a few characters have been able to save a few artifacts of human life outside the world as they know it to be. My very own imaginative place I'd like to venture out of New Jersey for is Florida Keys.The thought of the deep blue ocean, sunny days, vacation land, and adventure keep my imagination in gear for a future trip, but I don't plan on a frosty land trip like where Yeti community lives. Well, unless from a heated Gondola. GIVEAWAY: Enter for your chance to win a family pack to see the film. One winner will be chosen from the rafflecopter widget. Open to residents of contiguous USA. Must be 18 or older to enter and win. No post office boxes for shipping prize. This blog is not responsible for prizes reaching their destination from the provider. Winner will be notified by email and must reply within 48 hours or another winner will be selected. who's in this film? Lots of movie stars and a star Yeti of course. 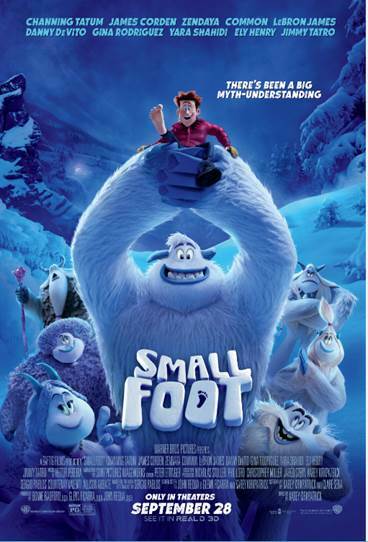 Still need to see more of SMALL FOOT? don't go yet, Watch and learn how to do The Yeti and share it for a chance to be featured on SMALL FOOT'S social media pages. Disclosure: I was given information, images, and promotional items for this post. The comments and views are my own.